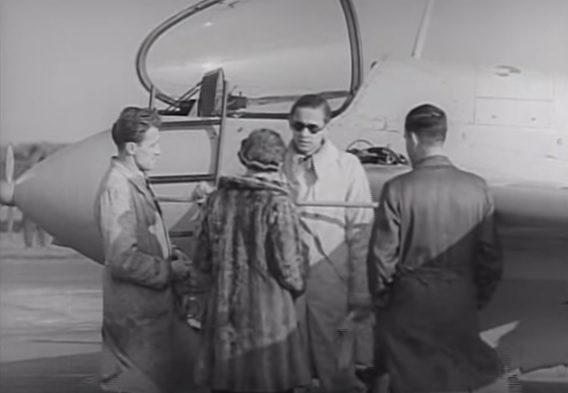 Test pilot Heini Dittmar chats with leading aviatrix Hanna Reitsch (in fur coat) some time (Franks in the latest Valiant Wings 'Airframe album' devoted to the Komet says 19 April 1944) prior to his record-breaking flight on 6 July 1944 at the controls of this Me 163 B V18 (VA+SP) powered by the new twin- chamber "cruiser" rocket motor which enabled the craft to achieve 1130 km/h or 702 mph, an 'unofficial' world speed record..
With only very limited endurance (seven and a half minutes of powered flight) the Me 163 was never more than a dedicated point defense interceptor. 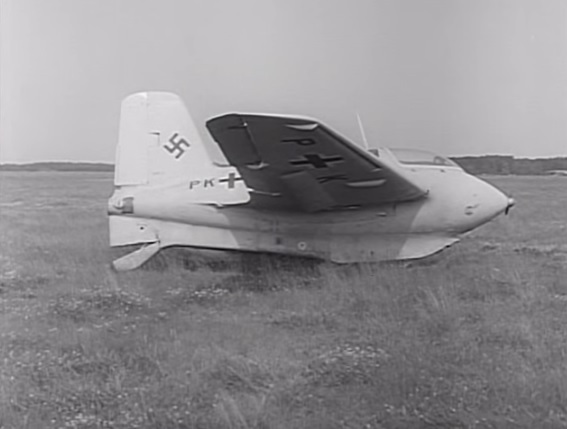 Various attempts were made to improve the short flight time. 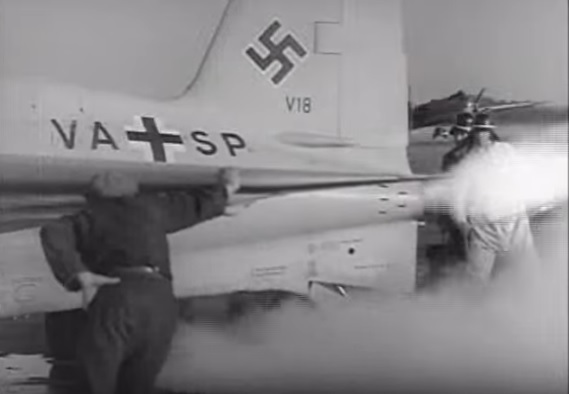 The aircraft in these screen captures (excerpts from the rocket.aero video "Wings of Fire" posted on youtube and similar stills published in 'Warbirds Photo Album' Vol. 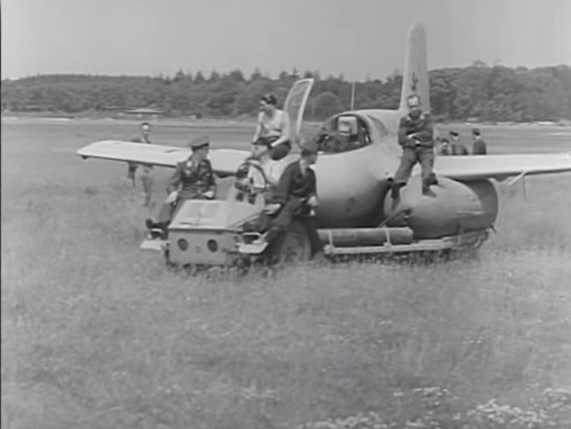 6) was an otherwise standard 'B' airframe 'VA+SP' which in the early summer of 1944 was fitted with a more advanced version of the 509 A rocket engine, the 509 B, which featured two separate combustion chambers of differing sizes, one above the other, for greater efficiency. The main combustion chamber or Hauptofen of the 509 B engine used for the V6 and V 18 utilised the same cube-shaped frame occupying the same location as the A-series' engine, with the lower Marschofen "cruise chamber" housed within the retractable tailwheel's appropriately widened ventral tail fairing beneath the exhaust thrust tube. 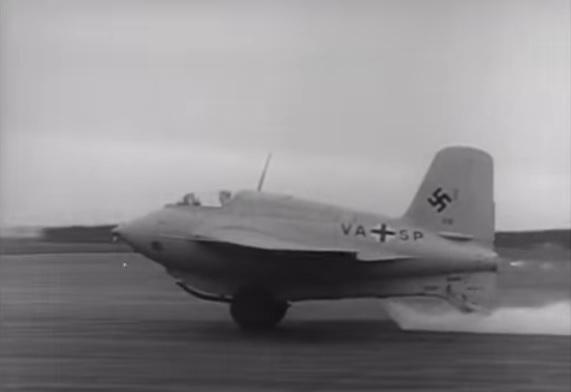 There is a decent image showing this in the new Valiant Wings Airframe Album devoted to the Komet or alternatively on the walterwerke.co.uk page here. 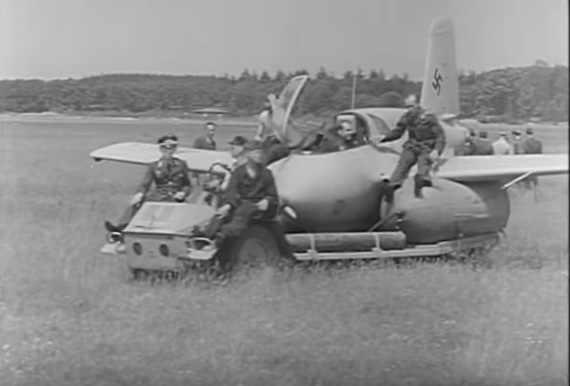 On 6 July 1944, the Me 163 B V18 (VA+SP) was flight tested for the first time. 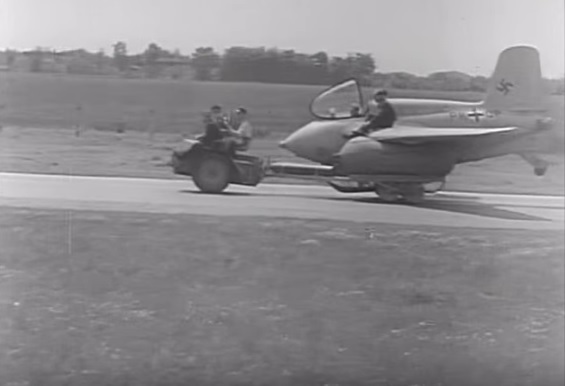 This test almost ended catastrophically but the power boost provided by the second 'cruise' motor broke the world speed record (unofficially). William Green's 1971 book "Rocket Fighter" details the 'world record' flight as having taken place on 6 July 1944. 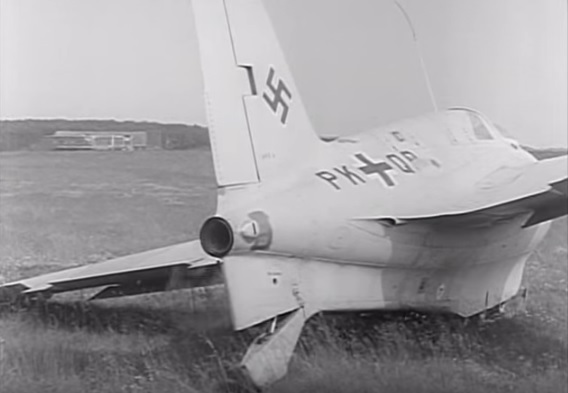 His text is unequivocal that the pilot who flew Komet V 18 that day out over the Baltic with "both rocket chambers functioning" was Rudolph Opitz. 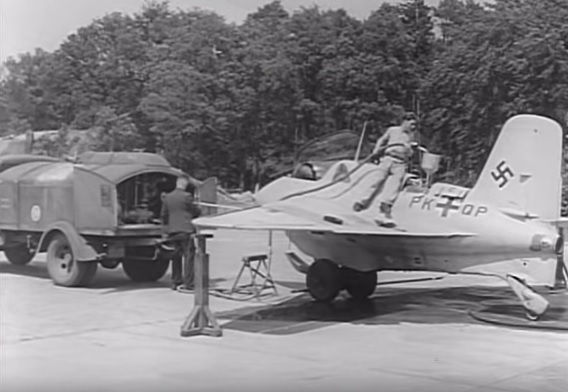 The pilot in these screen grabs is obviously Dittmar and not Opitz, although it should be stressed that these shots may not show the 6 July flight. 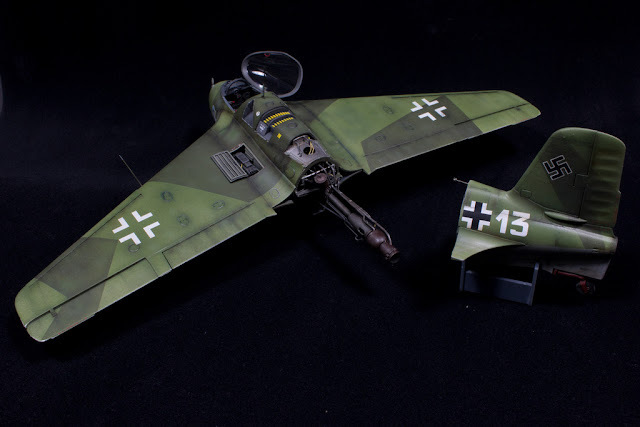 Dittmar had just spent the best part of two years in hospital, recuperating following a 1942 'crash' landing. The record-breaking flight began normally enough, but the rate of climb began to increase rapidly with the pilot soon finding himself exceeding the critical Mach number of the aircraft at above 16,000 feet. Dittmar cut power to the motor, causing a steep dive from which he only just managed to recover. It was later determined that the V 18 had reached a speed of 1130 km/h or 702 miles an hour. 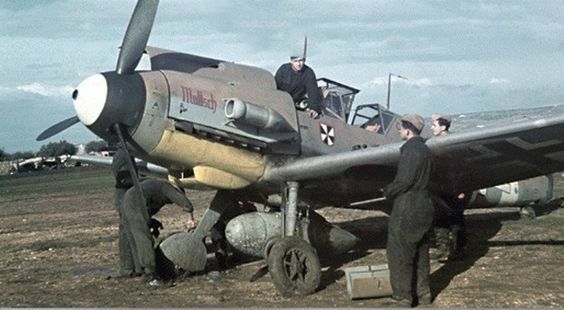 Upon landing back at Peenemunde it was found that the aircraft had almost completely lost its rudder. (photo in Green's account - Ransom and Camann's Classic title (2002) shows the same illustration of the V 18's rudder on Volume 1, Page 97, but, state that this occurred on a flight of 23rd December 1943, also flown by Heini Dittmar, and although this airframe was later used for assisted take-off rocket tests, they state this did not begin until 7th July 1944). 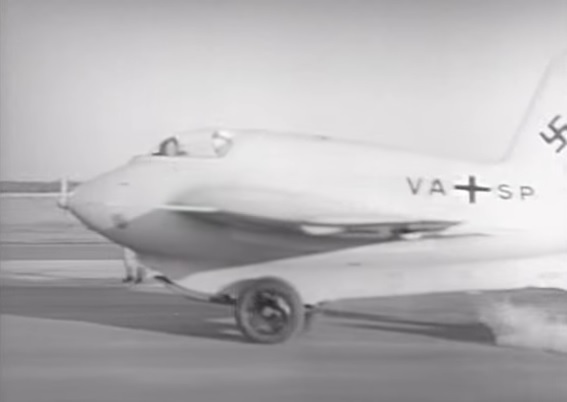 Below; the presumably still unmodified VA+SP getting airborne with Dittmar at the controls - unfortunately the 'Wings of Fire' commentary makes no mention whatsover of this developmental avenue. The overall single colour scheme may be RLM 76 or possibly RLM 63, close to Grau 02 but lighter.. The 509 B and 509 C rocket motors' main combustion chambers were supported by the "thrust tube" exactly as the 509 A motor's single chamber had been. 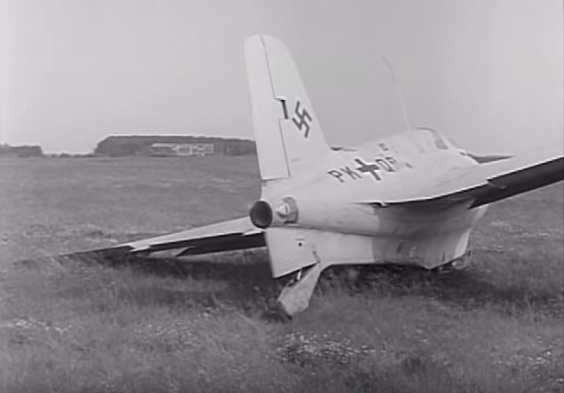 They were tuned for "high power" for takeoff and climb. 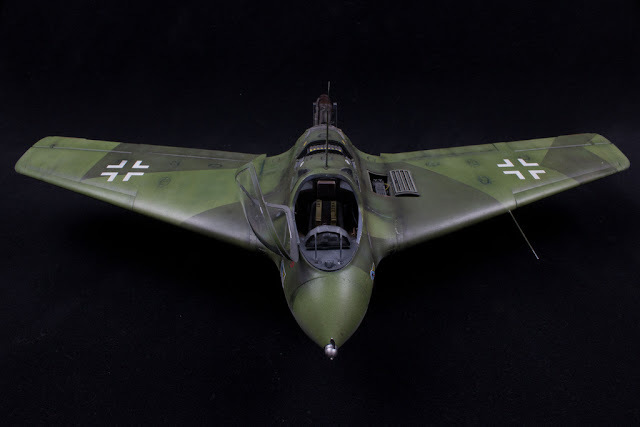 The added, smaller volume "lower" chamber on the two later models - dubbed Marschofen - with approximately 400 kg (880 lb) of thrust at its top performance level, was intended for more efficient, lower power cruise flight. 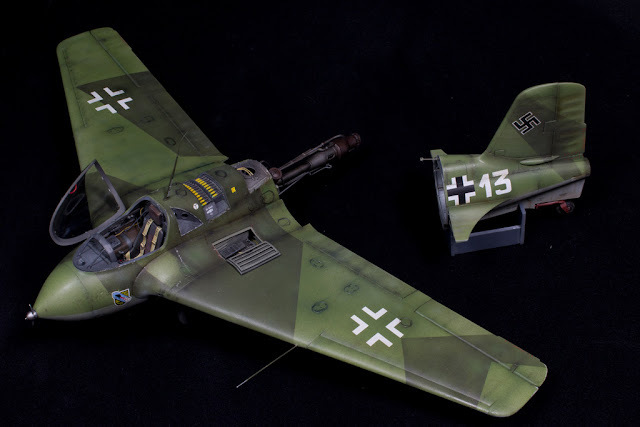 These HWK 109–509 B and C motors could potentially improve endurance by as much as 50%. Two Me 163 Bs, models V6 and V18 (above), were experimentally fitted with the lower-thrust B-version of the new twin-chamber engine. 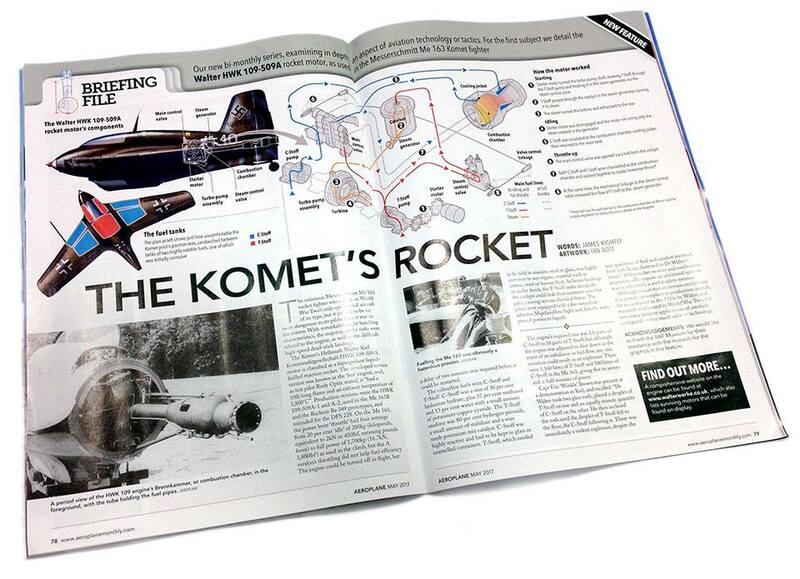 Pierre Giustiniani build of the Meng 32nd scale Komet for a forthcoming 'Wingmasters' feature..
Out yesterday the May 2017 issue of 'Aeroplane Monthly' publishes the first of a new Bott/Kightly feature entitled 'Briefing File' - the first of these looks at the Komet's rocket motor. Posted by Ian Bott at the Aviation Enthusiast Book Club on FB.